Take any four courses for Canada's only online Certificate in Law! The Queen’s Law Certificate is Canada’s only undergraduate law program to be offered by a law faculty both online and in a blended format on campus. Students can benefit from individual courses or work toward the full Certificate in Law. The Certificate in Law focuses on case law, statutes and policies for each area addressed by certificate courses. Students will learn the historical, social and economic forces shaping the law; methods of legal reasoning; how to develop, articulate and justify a position; and how recent domestic and international trends and agreements affect the law. To be granted the Certificate in Law, students must complete all four courses with a minimum GPA of 2.3 in each course, and an overall GPA of 2.6. For Queen’s University undergraduate degree program students*, two certificate courses can be applied to degree program as electives at the 200 level and at the home faculty tuition rate. Students can take courses in either blended or online formats. The other two courses must be taken at the 700 level with the Faculty of Law rate, which is $1260 for each course. 700 level courses are not counted towards the Dean's Honour List and do not count towards your degree requirements, however, are included in your final GPA. *For Arts and Science students, these two courses will count as the 6.0 units of non-Arts and Science courses that may count toward an Arts and Science degree (no further non-Arts and Science courses may be counted). For Arts and Science students also enrolled in the Certificate in Law, it is strongly recommended by your home faculty that the first two courses be completed at the 200 level. For all other students, including distance learners or letter of permission students, all four courses must be taken at the 700 level with the Faculty of Law rate, which is $1260 for each course. If admitted into the Certificate in Law program, please note you are only permitted to take LAW (online) courses that count towards your certificate requirements. 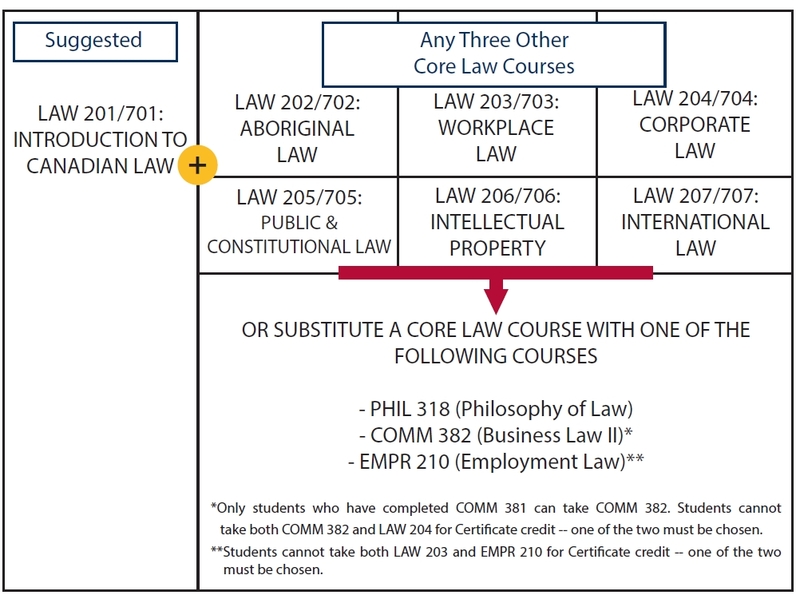 All students can complete Certificate courses in any order, but we strongly recommend that students begin with LAW 201/701 since it provides an introduction to the foundations of Canadian common law. Note that these courses are undergraduate courses in law, and as such, cannot be applied for transfer credit to the Juris Doctor degree program offered by Queen’s Faculty of Law. Undergraduate courses in law completed at other universities or colleges will not be assessed for transfer credit to the Certificate Program. Certificate courses will be available in both blended and online formats. Distance students (non-Queen’s students) may not take blended courses. Courses may be subject to change (Fall 2019 and Winter 2020). When you enroll in a Law course associated with the Certificate in Law, you are agreeing to write your final exam online. The benefits of this are that you can complete the exam in your own space using your own computer. For each exam, you will be using exam software developed at Queen’s by the Faculty of Health Sciences which is then integrated with an online proctoring system called Examity. Examity is an online proctoring solution that provides students the flexibility to take exams remotely while ensuring a high standard of academic integrity. To ensure a successful exam experience, you are responsible for ensuring that your computer meets the minimum technical requirements, as described on this website, your OnQ course page and syllabus. You also need to be located in an area with sufficient high speed internet at the time you are completing your exam. You will be given the opportunity to complete a practice exam in advance of the final exam. The purpose of the practice exam is for you to step through the online exam process and subsequently troubleshoot any problems in advance of your final exam. Exam times and dates are set by the University and cannot be changed. Please ensure to arrange your personal and work commitments around the 24-hour period that is allotted for you to schedule and complete your exam within Examity. Do not schedule vacations, appointments, travel etc. during the exam period as these requests are not considered conflicts. If you need to request to write your final exam on a different day and/or time, please contact your instructor directly. If you are a student registered with QSAS and will be receiving accommodations for your final exam, you must send your Letter of Accommodation to both your instructor and to the Law Certificate Program Coordinator, Amanda Blair at amanda.blair@queensu.ca. To review criteria and admission requirements for the Certificate in Law, please visit our Apply page. Bachelor of Commerce students may choose to designate an undergraduate Law course for pass/fail grading that would normally have letter grading. For more information on the academic regulations, please contact your home faculty office or visit the Bachelor of Commerce website. B.Comm students registered or considering applying to the Certificate in Law program within the Faculty of Law should not designate courses for Personal Interest Credit as these courses do not satisfy the requirements of the certificate. To be granted the Certificate in Law, students must meet academic progression. If a student designates a Law course for Personal Interest Credit (PIC) before accepting admittance into the Certificate in Law, this course cannot also fulfill requirements of the certificate. January 1 – March 31 are the open dates for Certificate applications for summer (courses beginning in May). May 1 – July 31 are the open dates for Certificate applications for fall (courses beginning in September). September 1 – November 30 are the open dates for Certificate applications for winter (courses beginning in January). Currently, all courses can be taken without admission to the Certificate in Law, through Queen’s Arts and Science Online. We recommend students apply and get accepted to the Certificate first, however. Only students enrolled at Queen's University are permitted to enroll in 200 level courses. Your final grades will appear on SOLUS. Official transcripts showing final grades will be available on the Official Grade Release Date. Please note, a mark of IN (incomplete) is considered a grade, and will be released on your official transcript with this grade. Once you have completed requirements for your Certificate in Law, you can apply to graduate in SOLUS. There are two convocation ceremonies; one in Spring (mid-June) or Fall (mid-November). If you’re unsure or would like to double check that you have satisfied your certificate requirements, email amanda.blair@queensu.ca. Please visit University Registrar for more information on graduation. Check out the tutorial for further details on how to apply to graduate. If you require an official transcript, or need information including ordering, how to receive and costs, please visit the University Registrar – Transcripts. The Certificate in Law is governed by the academic integrity policy adopted and adhered to by the Queen’s University Faculty of Law.